From the authors of the bestselling Hack Proofing Your Network! OPEC, Amazon, Yahoo! and E-bay: If these large, well-established and security-conscious web sites have problems, how can anyone be safe? How can any programmer expect to develop web applications that are secure? 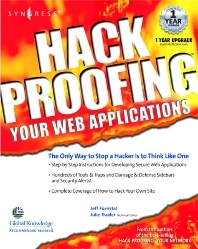 Hack Proofing Your Web Applications is the only book specifically written for application developers and webmasters who write programs that are used on web sites. It covers Java applications, XML, ColdFusion, and other database applications. Most hacking books focus on catching the hackers once they've entered the site; this one shows programmers how to design tight code that will deter hackers from the word go.